An exclusive hideaway in an exotic jungle location. 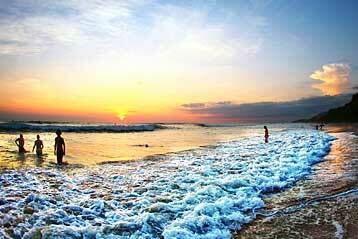 Quitzales Beach, Puntarenas, Nicoya Peninsula. Tango Mar is open all year round. Tango Mar is a delightful cluster of villas, oceanfront rooms and suites all nestled on a beautiful private reserve with superb beachfront vistas. The rooms have all been renovated recently to a high standard with elegant modern décor. If it is romance you are after, then look no further. 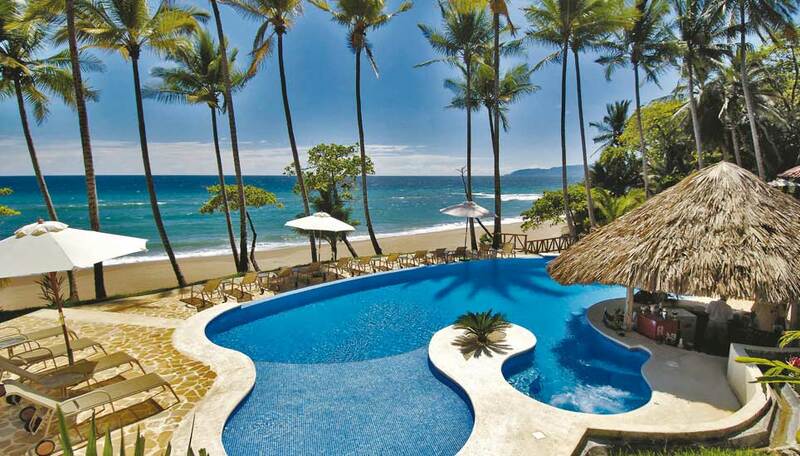 Tango Mar has it in spades from the Tropical suites, to the Tiki suites complete with Jacuzzi. You don’t get better views than this and the beachfront rooms, are exactly what they say. Whilst the beach isn’t private it is rarely occupied by more than a few people, and these are usually guests at the resort so it really is an exclusive location. Enjoy sumptuous dishes in the two restaurants. The chefs prepare dishes using fresh produce from the hotel’s own organic garden. There are four swimming pools, take your pick, a mini-spa and a fitness room. To top it all there are also several hiking trails on the private reserve where you can wander freely and explore the sights and sounds of the forest. Why go to Tango Mar? 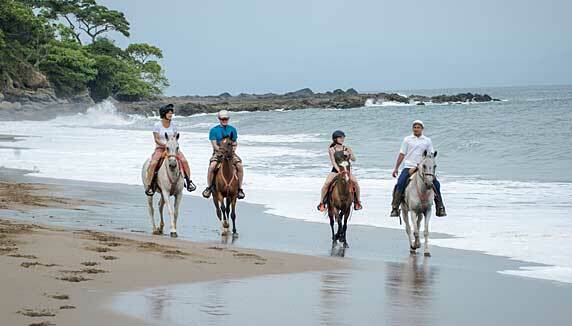 Tango Mar is 150 acres of exclusive private beachfront reserve with an array of added attractions. The blend of fine accommodation with exotic verdant jungle vegetation, colourful birds and wildlife makes Tango Mar the ideal hideaway for anyone who wants to enjoy refinement in a natural setting. With only 43 rooms and 2 private villas, the philosophy of Tango Mar is to provide a personal, friendly, relaxed and attentive service. Our attentive staff are there to ensure you have the perfect holiday. At Tango Mar you will find an abundance of and exquisite flora as well. You can also visit our unique viewing point where you can take in the magnificent view of the Peninsula. Our organic garden also attracts an array of birds and butterflies. There are several trails on the property and along the way you probably may encounter two the howler and white-faced capuchin monkeys. There is also an abundance of flora and fauna nearby too, at the Private Reserve Curu and the first National Park in Costa Rica, Cabo Blanco and if you love birdwatching the Pochote Mangroves is a great place to visit. Each room has a mini fridge, telephone, TV air conditioning, safe, en-suite, hair dryer, private balcony or terrace. Breakfast is included in your stay, and a welcome cocktail is served on arrival. Breakfast: Children from 0 to 5 years free. Children from 6 to 11 years pay a surcharge. Transport: Children 5 years and under travel free, 6 to 11 years pay 50% and 12 years and over pay the regular fare. Children’s menus are available at the restaurant. WiFi is available in the all the main areas of the hotel. 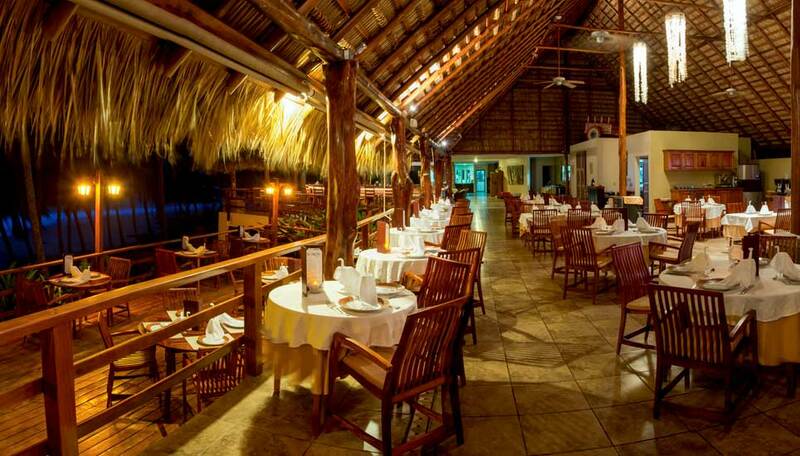 Tango Mar offers three different types of lodgings; ocean front rooms that mainly cater to families, tropical suites for couples and Tiki suites for the most discerning. All rooms have been recently renovated, have a private bathroom and are equipped with air conditioning, phone, satellite TV, a safety deposit box, a mini fridge and complementary coffee. Beach Front Rooms (18) You have never slept closer to the beach! 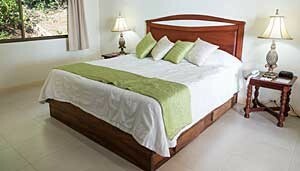 These spacious rooms, nestled in a tropical setting all feature 2 queen size beds or one king size bed. The private bathroom is equipped with all necessary amenities such as a hairdryer and a large shower. Enjoy the superb views from your private balcony and let the gentle sounds of the surf put you to sleep at night! Tropical Suites (12) These unique and charming rooms are built in elliptical-shaped clusters of three and surrounded by exuberant tropical gardens. They are located 80m from the beach and the golf course. Each suite is graced with a hand carved four-poster canopy king size bed and a Jacuzzi. Watch the monkeys passing by from your sun-deck! Deluxe Beachfront Room (6) This newly built block of 2 storeys houses 6 rooms in total, 3 on each floor. The rooms are elegantly furnished, modern and spacious, decorated with handcrafted wooden furniture. 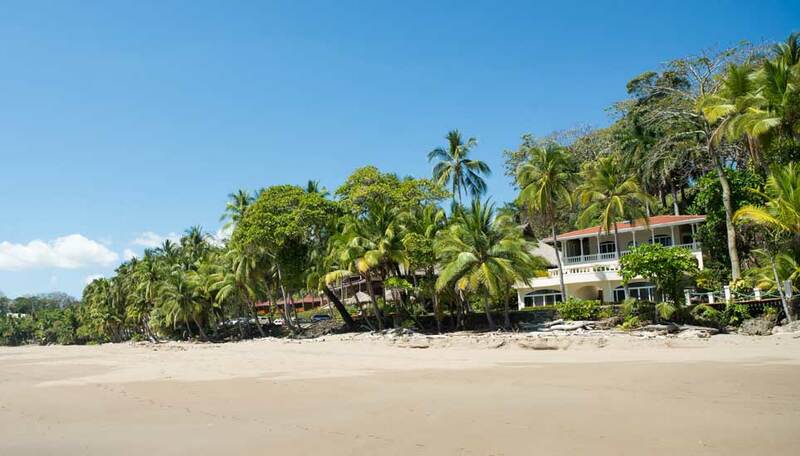 Located in the most tranquil part of the hotel, you are just a few steps away from the beach where you can enjoy spectacular panoramic views of our beautiful Quizales Beach and the Peninsula. It features a king size bed or two queen size beds, air conditioning, coffee maker with daily complementary coffee, ceiling fan, safety deposit box, telephone, satellite plasma TV, WiFi, a large modern bathroom with shower, hair dryer, bathrobe and an open-air terrace or balcony. Perfect for couples and honeymoons! Tiki Suites (5) These Polynesian-style cabanas are very romantic and located 20m from the beach. Decorated with a wood and bamboo theme, these suites are reminiscent of a private cottage. 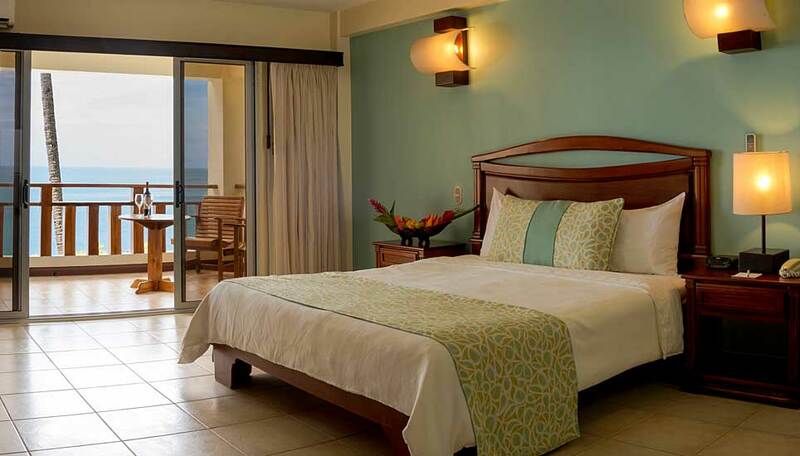 All suites have a wooden king size bed from where you enjoy the view of the ocean. The private bath features both a Jacuzzi and a shower. Beach Front Villa (Robinson Crusoe) This spacious villa has two bedrooms, two bathrooms, and comes with a fully equipped kitchen, living room and terrace. There is nothing that obstructs the view between you and the ocean except for a pair of hammocks where you relax, the only disturbance will be the sound of the waves and jungle animals. Daily maid service is provided. Royal Villa This beach villa offers a peaceful and relaxing setting on a deluxe level. This multi-tiered villa commands spectacular views, a fully equipped kitchen, living room with large terrace and each of the 5 bedrooms has a private bathroom with shower, there is air-conditioning, mini fridge, hair dryer and satellite TV.